While most people tend to picture robots in a modern environment, this intrepid four-wheeled robot traveled to India so it could help families in remote villages. Dr. Amol Deshmukh, a computer scientist at the University of Glasgow, wanted to study how technology could help low-income villagers living in the rural countryside. 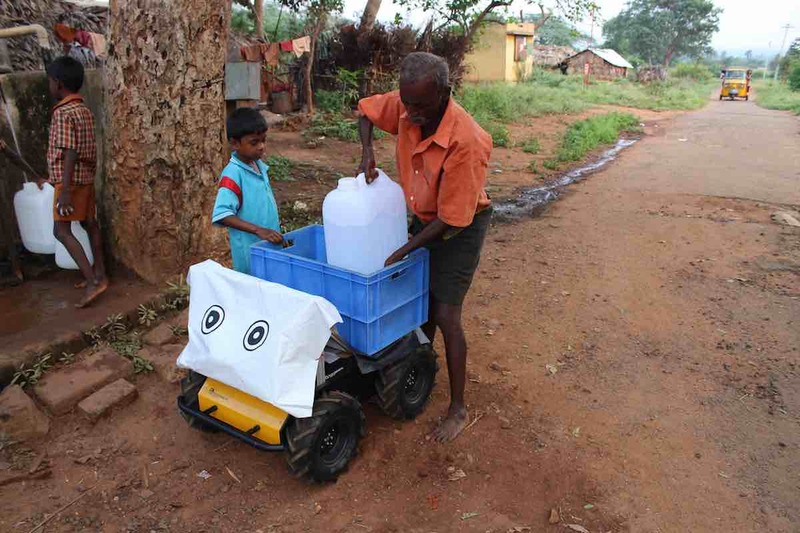 After visiting the village of Ayyampathy in southern India last November, Deshmukh and his team sent “Husky” the robot to help the villagers with the daily task of water-gathering. Since more than half of the Indian population is without tap water or plumbing, citizens will often spend hours hiking across treacherous terrain so they can collect water from a well. Husky, on the other hand, is a remote-controlled social robot that specializes in carrying large amounts of water across varied terrain. With the help of eleven village volunteers, Husky was able to carry three 20-liter jugs of water from the well back to the village. The robot emitted a male-sounding synthetic voice to thank the villagers for their help and tell them where to put the water. It even reminded them to wash their hands before their next meal. In addition to studying how technology could help the village, the researchers wanted to see how villagers from remote areas would interact with such a foreign object – and their findings were quite favorable. Deshmukh said: “Most of the research carried out to date on human-robot interactions are carried out in lab environments in urban settings, with people who have developed some conception of what robots are and how they work by seeing depictions of them in TV and film. Deshmukh added: “After several days of using the Husky, we surveyed each of the participants about their perceptions of the robot and how helpful they found it. “Every one of them said the robot made their lives easier, and they unanimously reported that they enjoyed working with the robot. Interestingly, they were also unanimous on the robot being ‘alive’, despite being aware that it was being controlled remotely. “We also asked if they thought the robot had a gender. More than a third of participants perceived it as ‘female’ although it communicated with a male-sounding voice and had no other gender-coded features, primarily because water-carrying is done mainly by women in their village.